SCVHistory.com LW3349 | Law Enforcement | Eugene W. Biscailuz, 27th L.A. County Sheriff 1932-1958 (Undersheriff 1929). Eugene W. Biscailuz in 1929, the year he organized the California Highway Patrol, as undersheriff of Los Angeles County. Three years later he became the 27th L.A. County Sheriff, a position he held until 1958. 7x9-inch matte portrait on heavy stock, inscribed: "To my good friend Chas, from Eugene Biscailuz / July 31, 1929." We do not know who "Chas" (Charles) is. Two weeks later, on August 14, the California Legislature would create the California Highway Patrol as a branch of the Division of Motor Vehicles with authority to enforce traffic laws on county and state highways. Biscailuz, then undersheriff, was appointed as the CHP's first superintendent. Somewhat ironically, Los Angeles County, with its own motor division, was the last holdout, relinquishing authority to the CHP in 1932. The CHP became an autonomous department in 1947. A resident of Boyle Heights, Biscailuz was no stranger to the Santa Clarita Valley. His uncle William J. Biscailuz was a Pico Canyon petroleum engineer from at least 1900 to the 1920s. William's son, Valentine, lived locally, married a local girl and raised his family in the SCV. Gene Biscailuz participated in local events throughout his tenure as sheriff and even after retirement. Eugene Biscailuz was descended from settlers; his long, colorful career as sheriff was marked by modernization. Los Angeles Times | October 21, 2007. Eugene Biscailuz joined the Los Angeles County Sheriff's Department as a deputy in 1907. He retired more than half a century later, including 26 years as the county's top cop. Before becoming sheriff, he made his name in a sensational hunt for a killer, bringing back escaped murderer "Tiger Woman" Clara Phillips from Honduras. He also served as first superintendent of the California Highway Patrol and was credited with modernizing it, making it a model for other states. As sheriff from 1932 to 1958, he transformed the department into a professional law enforcement agency. He pioneered the practice of putting good prisoners to work on honor farms and ranches in an effort to rehabilitate them. He also started the volunteer Aero Squadron, now an official county search and rescue team, and brought in amateur pilots Hoot Gibson and Howard Hughes as early recruits. At the same time, he was a courtly and colorful cowboy who sat astride a silver-saddled palomino at parades and rodeos. Before his death, Biscailuz donated 10 photo scrapbooks to the Doheny Library at USC and more than 40 boxes of personal letters and photographs to UCLA. "He was a link between the old and the new," said Lt. Paul Scauzillo with the sheriff's court service division, who has been using those resources the last three years to research Biscailuz's life. A short, stocky man, Biscailuz was a descendant of Jose Maria Claudio Lopez, a Spanish soldier at the San Gabriel Mission. With French Basque sheepherders and Los Angeles' early settlers as ancestors, Biscailuz mirrored the diversity of the region, speaking four languages: Basque, Spanish, English and Latin. He routinely bowed at the waist to ladies in his company. He was born in 1883 in Boyle Heights and as a boy peddled newspapers on Catalina Island in the summer. His father, Martin, who opened a downtown law practice, was the son of Basque immigrants who raised sheep on the Palos Verdes Peninsula. Eugene Biscailuz was 5 when his father celebrated his first big case, helping Domingo Amestoy, one of the largest wool producers in Southern California, win title to Rancho Encino, now Los Encinos State Historic Park. As Biscailuz recalled in a 1950 biography, "Biscailuz -- Sheriff of the New West," his father emptied a sack of $20 gold pieces on the table -- his $35,000 fee. His mother's family came from a long line of lawmen. His grandfather, City Marshal William Crossman Warren, was shot by one of his own men. From his Hall of Justice office, Biscailuz often pointed out to visitors that he could see the spot on Spring Street, a block away, where his grandfather was murdered over an unpaid bounty fee in 1870. In 1902, while working in a San Francisco bookshop, Biscailuz, 19, met and later married an Angeleno named Willette Harrison, who was then 16. Her father worked as a captain at San Quentin and later as Marin County sheriff. The couple returned to Los Angeles, where, in 1907, Biscailuz was sworn in as a deputy. In 1923, Biscailuz, because he spoke Spanish, traveled with the district attorney to Honduras to bring back Clara Phillips, who had escaped from the County Jail after being convicted of murder. She had ferociously killed her husband's lover with a claw hammer. Bringing Phillips back helped make Biscailuz's reputation. But he and his wife, who traveled with him as the department's "special matron," contracted a tropical infection from which she never fully recovered. Later, she was critically injured in an auto accident. Biscailuz was also involved in the 1927 manhunt for child kidnapper and murderer William Edward Hickman and led raids beginning in the 1920s that helped eventually put an end to the high-seas, high-stakes gambling empire of Tony Cornero and his sleek gambling ships. A stickler for policy, in 1940 he suspended the Hall of Justice jail physician for permitting mobster Benjamin "Bugsy" Siegel to leave his cell for chauffeured excursions to lunch and to visit his barber. During Prohibition, Biscailuz was one of an influential band of revelers who called themselves the Uplifters Club and built their own Rustic Canyon hangout. The exclusive men's group, drawn from the rich, powerful and famous, included newspaper and bank executives, and Hollywood celebrities Will Rogers, Walt Disney, Spencer Tracy, Clark Gable, Harold Lloyd and Daryl F. Zanuck. In 1929, the governor appointed Biscailuz to the CHP. 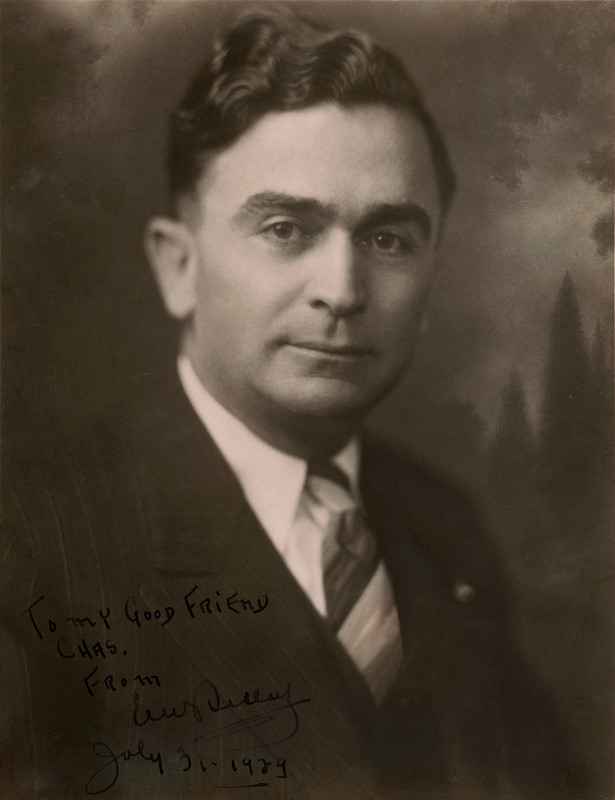 In 1932, Sheriff William Traeger stepped down early to run for Congress and urged the Board of Supervisors to support Biscailuz as his successor. Thousands of people signed petitions asking the same thing, and he was appointed. He later was reelected for six terms, unopposed. After the 1933 Long Beach earthquake, Biscailuz revamped the volunteer air squadron he'd started four years earlier, assigning a full-time deputy sheriff to the "Air Posse," the forerunner to the Aero Bureau. "Modern methods of fighting crime call for the use of radio, planes and ground police, all in coordination," he told The Times. During the Great Flood of 1938, while milkmen rowed deliveries on their routes and alligators escaped from the Lincoln Park alligator farm, Biscailuz's air squadron flew over the foothills, dropping food, water and medicine to marooned residents. In 1947, the sheriff's new juvenile facility and training academy opened on a 200-acre site on Eastern Avenue in East Los Angeles. It would later be named the Biscailuz Center. When he retired, the Board of Supervisors named Biscailuz "sheriff emeritus for the rest of his life." He moved into a building on Olvera Street, where he went on to serve as president of the El Pueblo de Los Angeles Historical Monument Commission. That building would be named after him too. 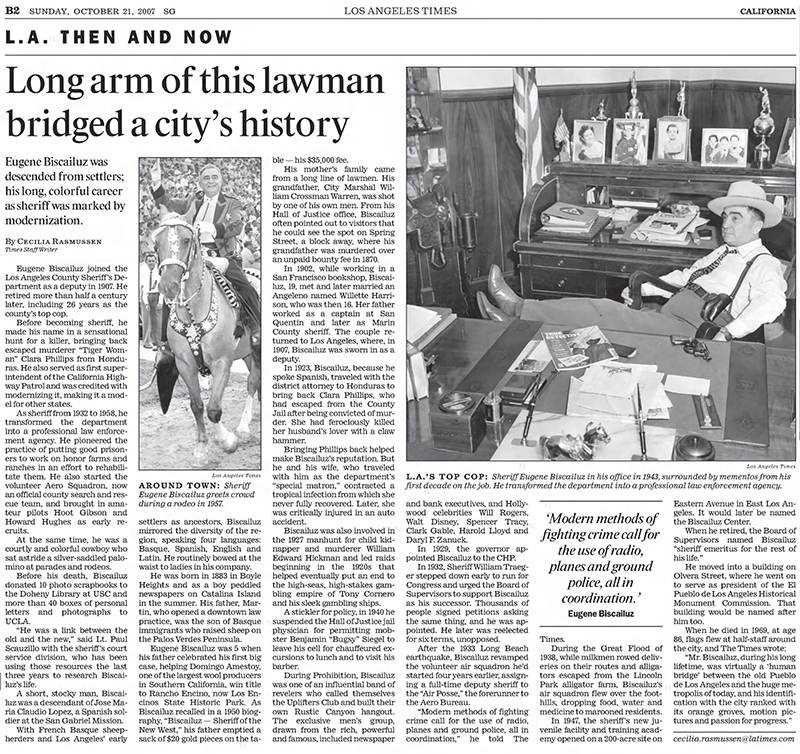 "Mr. Biscailuz, during his long lifetime, was virtually a 'human bridge' between the old Pueblo de Los Angeles and the huge metropolis of today, and his identification with the city ranked with its orange groves, motion pictures and passion for progress." LW3349: 9600 dpi jpeg from original photograph purchased 2018 by Leon Worden.